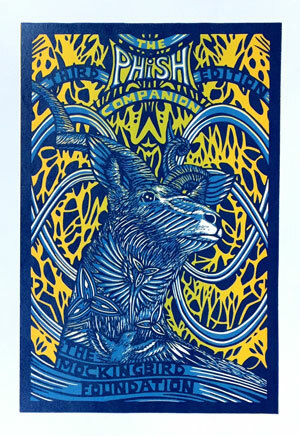 Esteemed printmaker Isadora Bullock has created a gorgeous art print for The Mockingbird Foundation to celebrate the recent publication of The Phish Companion, 3rd Edition. "Out of Control" is a four-color linocut reduction print, in a signed and numbered edition of 150. Previously only available from the Foundation at PhanArt shows, the print will be released for sale online on Thursday, October 20th at noon ET (9am PT) via the Bottleneck Gallery web store. All proceeds benefit music education for kids. This is a small edition from a very popular artist, so run run run on Thursday and don't miss out! On sale tomorrow; come and get it! Anyone know how many more prints are going to be released with the companion label on them?